Many automotive manufacturers are experimenting with 3D-printing as it can help vehicles lighter, more fuel efficient and can make the production process smoother. 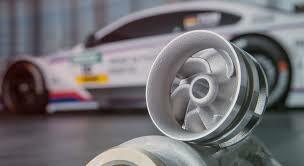 BMW first started experimenting with 3D printing in 2010 for its DTM cars which needed lightweight water pump pulleys. Two years later, in 2012, BMW started using parts made through additive manufacturing in series production for Rolls-Royce cars which needed laser-sintered parts. These parts must have met Rolls-Royce’s exacting standards as from 2017, Rolls-Royce has been using 3D-printed fiber optic guide fixtures also for the Rolls-Royce Dawn at the Goodwood factory. Currently, Rolls-Royce uses a total of ten 3D-printed components throughout its range. BMW has also been using 3-D printing to make the custom indicator inlays and dashboard trim strips for Mini models, while it prints aluminum alloys for the BMW i8 roadster. A key component of the i8 Roadster’s roof mechanism and its window guard rails are made using 3D-printing. According to BMW, the metal components weigh less than the injection-molded plastic components, while offering higher levels of stiffness. BMW can make up to 100 window guide rails in 24 hours using HP’s Multi Jet Fusion Technology. BMW’s achievement of making one million 3D-printed parts in the period from 2010 is truly commendable and sets an example that other automotive manufacturers should try to follow.